In a healthy hip, smooth cartilage covers the ends of your hip bones, allowing the ball to glide easily in the socket. Smooth weight-bearing surfaces allow for painless movement. In a problem hip, the cartilage "cushion" wears away, and the bones rub together, becoming rough and pitted. The ball grinds in the socket when you walk, causing pain and stiffness. A painful, stiff hip can keep you from doing simple things in life, even walking without pain. Today, physicians can replace your problem hip, thanks to improved surgical techniques and materials. Total hip replacement is a safe, reliable procedure that can relieve your pain and stiffness and return you to the activities you enjoy. Total hip arthroplasty is the replacement of a worn out hip with an implant that is designed to function like the patients own joint prior to the onset of the disease process. 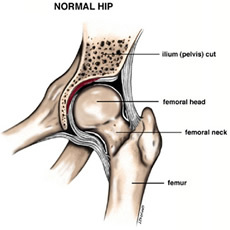 Your hip is a simple ball-and-socket joint where your thigh bone joins with your pelvis. Surrounded by cartilage, muscles, and ligaments, your hip is the largest weight-bearing joint in your body. Smooth cartilage and bone help you walk easily and without pain. In the normal situation both the femoral head and the acetabulum are covered with a thick layer of articular cartilage. It is this thick layer of cartilage that protects the underlying bone and acts as a gliding surface (with less friction than water on ice) during pain free joint motion. 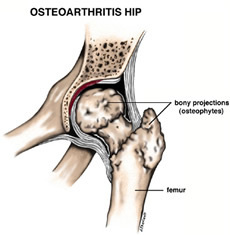 Technical advances have given us new materials to replace your problem hip with a prosthesis (artificial hip joint). Like your own hip, your prosthesis is made up of a ball and socket that fit together to form a joint. Our team chooses the best prosthetic design for you after carefully diagnosing your particular hip problem. Your surgery is recommended only after diagnosis of your hip problem, including your degree of pain and lack of mobility. Your history includes questions about your hip pain, medications you may be taking, prior injuries, and other bone and joint problems you may have. Your physical examination includes assessing the range of motion in your hip and other mechanical medical factors. X-rays provide our team with a picture of your hip bones and joints. Once it has been determined that you are a candidate for a total hip repacement, our team will review potential risks involved and what you can expect before, during and after surgery. You will also be given pre op instructions. Tradionally, patients may be hospitalized for 24 hours - 48 hours. However, in recent years research has shown improved outcomes for patients with even shorter stays and in many cases, your total hip replacement can be preformed on an outpatient basis allowing you to return home the very same day. After surgery, specially trained nurses will be with you to make you comfortable and give you pain medication for any discomfort. A pillow between your legs may be used to keep your new hip in position. Your nurses can help you with coughing and deep breathing exercises, to help prevent lung complications and start you on the road to a safe recovery. Once you are ready to go home, you will be given any necessary instructions for your safe home recovery. Our team will review precautions and you will be given exercises to begin your healing process. After a total hip replacement, you can expect to mobilize quite quickly. After surgery, you will begin physical therapy exercises to help strengthen the muscles around your new hip and regain your hip's range of motion. As soon as possible, your physical therapist helps you start walking to promote healing. Replacing your problem hip with an artificial hip can relieve your pain and stiffness and return you to the activities you enjoy. A problem hip can be safely replaced at any age, and with proper care, can last for many active years. With your new hip, you can look forward to getting back to participating in the activites you enjoy and back to the life you love.